Iranian authorities have ignored requests to reinstate a student expelled from a university because of his faith. 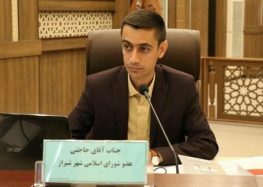 Nineteen-year-old Faraz Karin-Kani Sisan was expelled from Ghiyaseddin Jamshid Kashani Institute for Higher Education (GJKI) in Abyek, Alborz Province, 62 miles northwest of Tehran, after completing his second term in development studies. “In the national university entrance exam form they ask if you would like to answer religious questions about Islam, Christianity, Zoroastrianism or Judaism. I, like many other Baha’is, chose Islam and answered all the questions. I passed the exam but after I enrolled as a student I was asked to state my religion. On the enrollment form I marked the box for “religious minority” and when an official asked me to be specific, I said I am Baha’i. Then he asked me to write it down as my choice,” said Sisan in an interview with the International Campaign for Human Rights in Iran. In June 2016, a few days before the end of his second term, Sisan was summoned to the intelligence unit’s office and told he had been expelled. “When I went to the administration office, I was told they don’t have a problem with Baha’is but the Science Ministry had sent a directive to all universities compelling them to expel all Baha’i students. I had no choice but to settle my account and leave,” he told the Campaign. Iranian officials deny prosecuting Baha’is for their religious beliefs, but the Baha’i community is one of the most severely persecuted religious minorities in Iran. The faith is not recognized in the Islamic Republic’s Constitution and its members face harsh discrimination in all walks of life as well as prosecution for the public display of their faith. Baha’is are routinely denied higher education. In a recent case, Rouhie Safajoo was repeatedly banned from attending university and was arrested on March 8, 2016 for allegedly “acting against national security on cyberspace” after protesting the situation on Facebook. “We will never accept that Baha’is have the right to education. They don’t even have rights as citizens,” said Ayatollah Mohammad Mousavi Bojnourdi, a former member of the Supreme Judicial Council, in a December 2014 interview with the hardline Fars News Agency. Iran’s supreme leader, Ali Khamenei, has declared Baha’is “unclean” and forbidden Muslims from having any contact with them. In May 2016, Faezeh Hashemi, the outspoken daughter of former Iranian President Akbar Hashemi Rafsanjani, was threatened with jail time for meeting with her former cellmate, Baha’i leader Fariba Kamalabadi, while Kamalabadi was on temporary leave from prison.